Over the course of the day, each team developed a technical report, a business plan and scale-models of their solutions. The event highlighted entrepreneurship, design thinking and societal impact, in addition to team building and leadership development. Two students were recognized with “Master Team Builder” awards — Katriel Cole from Logos Preparatory Academy and Luvai Khambaty from Cypress Lakes High School. Students from seven high schools participated in the event, hosted by The Woodlands Christian Academy. 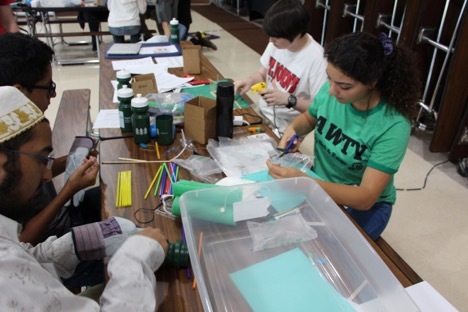 All teams completed the “Convergent” Challenge, and some teams also completed the open-ended “Divergent” Challenge, which challenged students to create a product that solves any problem related to climate change. First place for the Design-A-Thon’s “Convergent” Challenge was awarded to the “Cipher Engineering” team with students from Awty International School, Harmony School of Innovation – Katy and St. John’s School. First place for the “Divergent” Challenge was awarded to the “Creative Waters” team with students from Awty International School, Cypress Lakes High School, Logos Preparatory Academy and St. John’s School. While students were busy designing solutions, Engineer Your World teachers had the opportunity to participate in professional development sessions and discussions about best practices in teaching engineering. The participating schools were Awty International School, Carl Wunsche Sr. High School, Cypress Lakes High School, Harmony School of Innovation – Katy, Logos Preparatory Academy, St. John’s School and The Woodlands Christian Academy. Engineer Your World is a high school curriculum program, developed with funding from the National Science Foundation, that was created by faculty in the Cockrell School of Engineering at The University of Texas at Austin, NASA engineers and secondary teachers. The curriculum, which includes courses and comprehensive teacher support programs, is being used in over 200 high schools around Texas and the U.S. Engineer Your World engages students in authentic engineering experiences and inspires them to embrace an engineer’s habits of mind through collaborative, student-directed projects that empower students to think like engineers, adopt engineering processes and pursue engineering disciplines for the betterment of our world. For more information on Engineer Your World, visit engineeryourworld.org. For more information and photos from the Solve it by Sunset Design-A-Thon, visit engineeryourworld.org/2018-solve-it-by-sunset-design-a-thon.